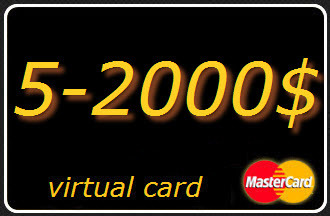 Virtual card - a prepaid bank card, which has no material carrier and intended to make purchases on the Internet. Simplicity and speed. You do not need to visit a bank to issue the card and wait for its activation. Pay card can be as soon as it received the details. -Security. You do not need to "shine" their salary or credit card. Details of the main card remains secret. -Convenience And mobility. To purchase enough to know the card details and have access to the Internet. - The country of the bank that issued the card - Russia. After payment you will receive a unique code generated by the service. This code should be reported to the seller to confirm the transaction. - Expiry date - month and year. Successful you shopping with Virtual Card!